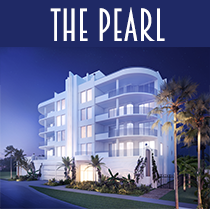 Pam Charron and Bev Murray Team To Market The Pearl. Berkshire Hathaway HomeServices Florida Realty Luxury Realtors, Pam Charron and Bev Murray, today announced a contract with developer Golden Gate Point Ventures, LLC, to market and sell The Pearl, a unique, boutique, “tropical deco” development comprising of eight 2,750 sq ft modern residences with water views of Sarasota and Marina Jack. Pricing Starts at $1,495,000 with completion in May 2019. Golden Gate Point Ventures, LLC, David Gruber commented, “We are excited to be working with Pam Charron and Bev Murray marketing and selling The Pearl. The choice to partner with them was simple, given the Berkshire Hathaway brand, reach and audience demographics, their expertise in high end listings and new developments in Sarasota and their successful track record and volume of home and new construction sales. Designed by Hoyt Architects and built by Divisions Unlimited of FL, The Pearl offers luxury living on Golden Gate Point. 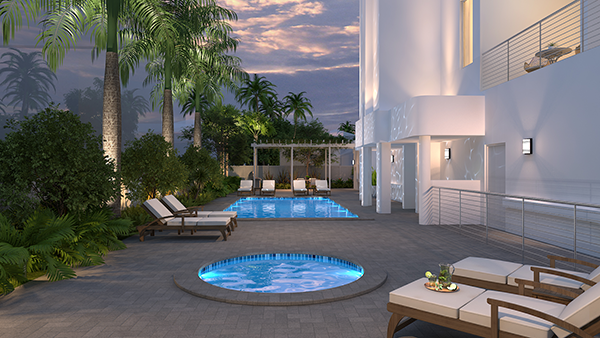 Sarasota’s newest boutique condo community features only eight distinctive residences, each with elevator entry into a private foyer, expansive terraces to enjoy outdoor living with eye-catching views of boats moving along the Bay, and individual private 2 car garages. A fresh and modern design with 11’ ceilings, open and flexible great room floor plan with top quality finishes. Premium wood cabinetry with quartz countertops, Jenn-Air stainless appliances and a spacious island in the kitchen. The sizeable owner’s retreat has dual closets and a luxurious, well-appointed bathroom. Light and bright with lots of windows, your guests will enjoy en-suite accommodations with private balconies. Amenities include a nicely landscaped common area with heated pool, spa and gazebo with grill area. Iron gates, secure building entry, guest parking on street, hurricane resistant new construction and pet friendly. Enjoy the best of city living with beautiful views of Sarasota Bay and the City, plus a rich urban experience where you can bike or walk along the brick lined streets to the Ringling Bridge, St Armand’s Circle, the Ritz Carlton, Marina Jack and amazing arts, dining and theatre venues.